When my husband and I lived in Chicago, we started a tradition of avoiding restaurants on Valentine’s Day. We figured they would be just too crowded. But since we still wanted to have a special meal without having to cook all day, we began to put together a great big indoor picnic with different kinds of cheese, fancy cured meat, fresh fruit, fruit spreads, crackers, hummus, fresh veggies, and chocolate. We’ve continued this tradition even though we’ve moved away from the big city. I’m already looking forward to this year’s feast. This year, I found a dessert recipe so easy and tasty I just had to break my “no cooking” rule. 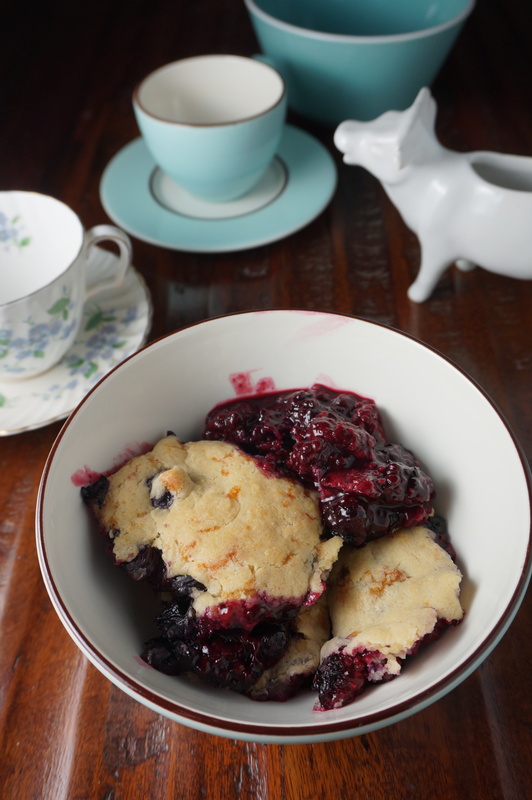 It’s just a mix of berries with cheddar biscuits on top – a simple cobbler made even more elegant and unexpected with the addition of Conebella Farm sharp cheddar. This makes two generous portions, with maybe a little leftover for breakfast. Mix flour, brown sugar, baking powder and salt. Cut in butter with pastry blender. Stir in Conebella Farm sharp cheddar, milk and vanilla. Mix berries with flour and sugar. Add to bottom of a glass baking dish. Spoon the biscuit dough on top. Cook for 40 minutes or until biscuits are golden brown. Serve with milk, whipped cream, or ice cream.